WILLIAMSTON, Mich.–It’s often quoted that memory is a curious or fickle thing. Some people remember the little details of an event, while others, maybe even someone sharing the same memory, remember it far differently or maybe not at all. Sometimes it’s all about perspective or even how healthy the mind is to remember it at all. 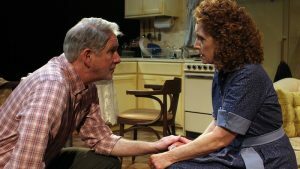 To Quiet The Quiet, a world premiere play by Christy Hall, tackles this thought process as the first play of the new year at Williamston Theatre. To Quiet The Quiet is the third premiere play in Williamston Theatre’s “Lucky Season 13.” Advertised as a psychological mystery, Hall’s play is her second play premiered at The Williamston in the past two years. Just over an hour in length, though short and seemingly pieced together, it all falls together in the “ah ha!” just before the climatic moment at the close. The play opens up with Quinn (Steve Wojitas) helping Kathy (Brenda Lane) through a breathing exercise to calm down. Throughout the play, these breathing exercises are frequent and necessary to calm Kathy down. The sound designer, Jason Painter Price, used breathing sounds to enhance Kathy’s extreme need to focus on her breaths to “quiet the quiet.” He also added external noises that explode simultaneously as Kathy has her Tourette’s syndrome-like outbursts. Quinn is demanding Kathy to recount events exactly as they happened. However, it’s unknown when the event in question took place. It’s all left to wonder what happened. Or, did something bad happen and she’s trying to make an alibi? Who is Quinn? Why is he there helping her? Details are twisted and explained and re-explained to make a believable story. A believable story for what? This question stays pregnant as the story changes, expands, and grows as more information is added. The pieces come together as the audience’s own memories have to decide what is actually happening or going to happen. Scenic designer Lex van Blommestein and set dresser Michelle Raymond worked hand in hand to successfully fill the small staging space with a very sparse, but comfortable apartment living area in the 1990’s right down to the sandstone coasters and the mini-Cabbage Patch collectible on a shelf; an apartment, the story later exposes, that Kathy’s ex-husband Todd (John Lepard) wants to take away from Kathy. “Dead men can’t win,” Kathy says to Quinn and again to Todd. “Dead men can’t do anything at all.” Just like all mysteries, an obvious foreshadowing occurs while Kathy and Quinn are trying to sort out her memories which aren’t really memories at all. The ending is surprising to say the least, but satisfying as all the pieces fall together. Everything becomes clear as Brenda Lane dominates the stage in the play’s final moments, deafening quieting the quiet, or better yet, probably the very opposite. Even though February is the month of love, this is definitely not a love story with a happy ending. It’s a deep dark piece that showcases how the mind is a powerful thing.